BLUEBERRY SEASON (D. Trimmer) Tet. (Carol Todd X Florence Denny) 35” 7 3/4” EM Re. Ev. 16 buds. 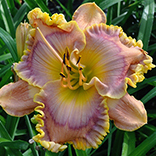 This is a tall, very large lavender cream bloom with a dark lavender blue eye and edge surrounded by gold. Blunt sepals and a flat circular form show off the subtle beauty of BLUEBERRY SEASON. 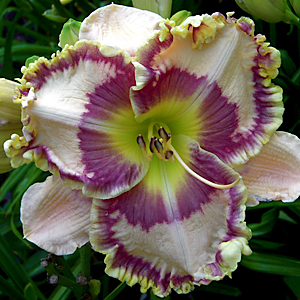 Our cream FLORENCE DENNY gives very large size, clean color and probable northern hardiness as both parents thrive in the north. We have reports of CAROL TODD doing well in Canada.